Something I usually do with my very young learners at the beginning of the scholar year, is to help them learn how to have a little chat. Why do I do that? Very simple, if since the very beginning of the scholar year they see some instant results, they will be very happy and pleased with themselves seeing they are able to communicate with others in English after only a couple of lessons. That will mean motivation and excitement to go on learning words and sentences and finding a situation in which to use them (the English class, or not!). 2) NICE TO MEET YOU! 1 – NICE TO MEET YOU, TOO! As you can see, it is a very repetitive story, which is great because young children love easy repetitive stories. 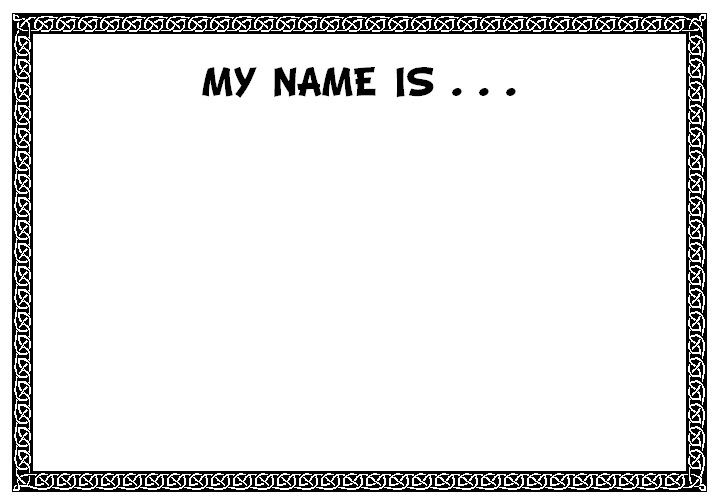 If you tell it, you will see that before you end the story, your pupils will start saying “What’s your name?” before you do it every time you show a new slide. Feeling you are part of the story is a fantastic sensation everybody enjoys, so imagine how little children live it! Once they have all traced and decorated their names, we hang them on the classroom walls. If you want, you could make yours as well, my pupils always find it amusing when I take part in the games and activities doing exactly the same they are asked to do. There is this excellent song that goes with the story which I also like using in class and my pupils love singing and dancing it with me. We all stand up in a circle and everytime we sing “what’s your name?” we look at the person next to us (first on the right, then on the left), when we sing “my name is…” each of us yell our own names and when we sing “nice to meet you” we shake hands with the person next to us (first on the right, then on the left). Finally, the big moment!!! I ask my pupils to stand in front of the class and perform the little chat I mentioned at the beginning of this post. They do it in pairs and they have to shake hands when they say “nice to meet you” (they usually giggle when doing it, they find it funny!). I ask them to perform it several times with different partners so they get used to collaborate with all their classmates. I suggest you film them and then show them the video. They will really like seeing themselves speaking in a language that is not their mother tongue.